In his Azerbaijan handbooks published over 20 years ago, Dr Ceresa established that the 1922 Postmaster Provisional overprints of Azerbaijan were very soon (within three years?) reprinted by the Azerbaijan Philatelic Association headed by Kusovkin, who was appointed to his (newly created) post by Chuchin's Moscow-based association which later became the Soviet Philatelic Association. 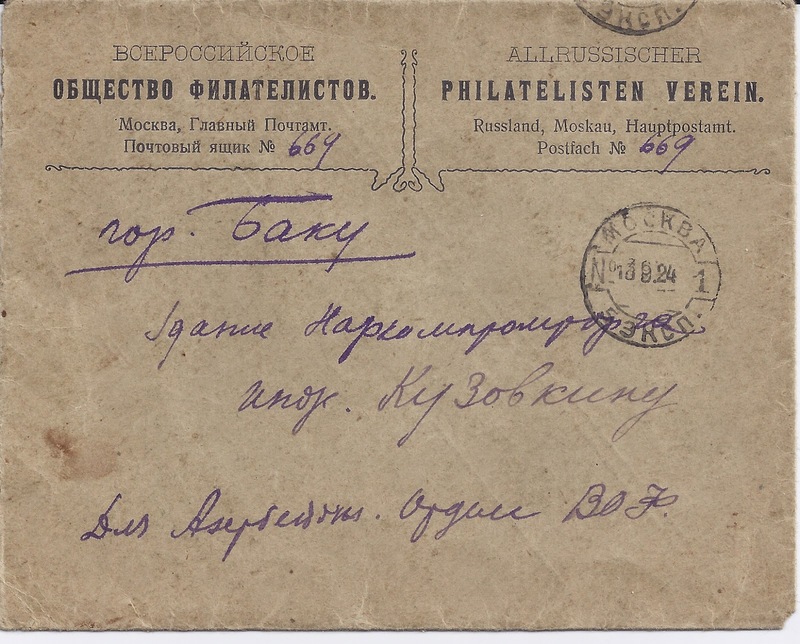 Above I show a 1924 cover addressed from the Moscow VOF to Kusovkin at the Azerbaijan branch of the VOF. I once had a copy of Kusovkin's letter of appointment - I think it is now in a collection held in the Czech Republic. Anyway, looking at the latest auctions I saw some Kusovkin reprints on offer. How do you tell the difference between Originals and Reprints? 1. Reprints are on original stamps but they are always mint, though possibly sometimes Cancelled to Order. Postally used overprints will always be Originals. Mint copies of the Originals do exist and some supplies may have reached West European dealers. Some bear old expert signatures. 2. The original overprints were made locally at post offices using counter stocks of stamps. These were often with gum. But Reprints were made from remainder stocks and these are normally without gum. It would be nice to think that the with gum / without gum test is decisive but I think it is only a matter of probability. 3. The handstamps were cleaned for the Reprints and they are carefully applied, quite often inverted or double and so on. Original overprints are often unreadable from heavy inking or careless printing. 4. The handstamp of the Azerbaijan Philatelic Association was often applied to Reprints. It reads AZ VOKA in Cyrillic and is boxed - I don't have a copy at the moment. To the best of my knowledge, no Originals received this handstamp. 5. It does seem that experts before Ceresa were aware of the existence of reprints - AZ VOKA signed stamps rarely if ever also show the signatures of W. Pohl, Dr Jem etc. However, not all Reprints were AZ VOKA signed and on unsigned reprints you do find what are normally reliable expert signatures. Surprisingly, Voikhansky in his important Azerbiajan handbooks seems not to mark the distinction between Originals and Reprints. 6. There are some differences in the ink, especially the black inks. These are generally greyer and less dense on the Reprints. This is a case where pictures do not help much - the information I give above does however help solve at least half of all cases where one asks, Is this an Original or a Reprint?